I used 2 balls of Katía Jamaica in a yellow/green/red/brown blend and a 3mm hook. Work 48 chain stitches, turn and work in slip stitches or double crochet – whatever you prefer – untill you have rectangle 20 cm wide and 53 cm long. Or thereabouts. Stitch the bag together, and make a narrow strap (8 chains wide) and attach it to the top corners. If you like you can leave your bag flat, or you can turn it inside out and fold the bottom corners to form a flat bottom and fasten the flaps with a few strong stitches. You don’t have to crochet this – you could also use a felted, knitted rectangle or a length of fabric. Make it small and use it as an evening purse or make it huge and use it for shopping. The name Masa Bag is inspired by a Canarian/Japanese sushi place in Las Palmas I visited just after buying the yarn. My bag is Spanish-Japanese just like Hideo the sushi cook! This entry was posted in Crochet, Free patterns and tagged bag, craft, crochet, Easy as pie, folding, homemade, Japanese, Katia, tote. Bookmark the permalink. Well, I do have the crochet hooks…. … oh probably. Whether to use my new favourite green cotton DK that was going to be a summer top, or to make one in loud blues and yellow. Or the banana yarn maybe? Decisions, decisions…. @Janet, no the folding isn’t on the furoshiki page, but I’m sketching and testing and photographing so I’ll post the folding instructions tomorrow. never mind my friend helped me! thanks! Great!! I will anxiously await your drawings then… it really is awesome! Beauteeful! I love the felting idea. Next time I get together with my sisters, we could do this…thanx! It looks great. so simple and so clever. well done. I’ll try it too soon. it must be very easy, cause it looks so complicated ;). looking forward to it. Thank you so much for the pattern! It was a terrific first project. I’m a newbie and am most comfortable with Tunisian right now – so I did the whole thing in Tunisian simple stitch. I used wool so it’s a bit stretchy, but I doubles the handle (and used a Tunisian join on the edges) to stabilize that bit. This is a very nice souvenir! The restaurant is closed since June, I am so sad about. Un abrazo muy fuerte! Lisa, great desing!!! lovely colors. Great design, but I don’t see the actual pattern. Is it still available? Thanks! Can someone put Youtube video on how to fold this purse I am going nuts trying! Thank you so much! this is fantastic! crochet on my friend! I love this bag! Marvellous!!! Can you write a more detailed pattern/instructions please. When did you switch colors? How many rows of each color did you do? Did you sew the bag with thread? Did you sew it on th outside. Its a very pretty bag and I feel like I’m missing out because there’s not enough instructions. Do we have permission to sell what we make from the pattern . For this pattern, yes – this is a traditional Japanese method of folding a piece of material into a bag, so feel free to make your own version and do with it as you like. Hi Pamela, no I haven’t made a video. My best advice is to try it with a piece of paper first. Good luck! We use the metric system in Europe and when I use US patterns I convert inches to cm and I expect Americans do the opposite. Love love love the bag! I hope I didn’t miss this upstream in the comments, but what are the dimensions of the finished bag? I tried folding paper to get an idea and it seemed really small for my needs. Will it work if I kept the ratio but made it larger? Hi Rory, you can make it any size as long as you keep the ratio! I made it with tshirt yarn and those dimensions make it quite a small bag. I want to make a smaller version for my iphone. Should I just half the pattern? 10 cm x 26 cm. I’ll let you know how it turns out for other posters that want a smaller bag. I love this bag so much I’ll probably make a bigger one as well. Hello, If the width is 12 inches wide should the length be 36 inches? Hi there. I love the idea of this bag and made a few mods to it just as a personal preference. I was hoping to put a couple of them on my Etsy shop. Would this be acceptable provided I included a link to your original post? For this pattern, yes – this is a traditional Japanese method of folding a piece of material into a bag, so feel free to make your own version and do with it as you like! 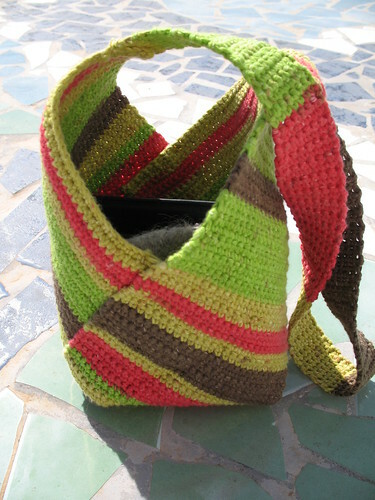 Have finished crocheting bag & folding into purse shape…can’t figure out how you stitched seams as shown in pic, so stitching doesnt show in multi stripe pattern. If machine stitched, how to stitch bottom corner? Pingback: Please. Don’t say you’re making a scarf. Hi there! I’m attempting to make your beautiful Mesa bag and I have my rectangle made, a touch wider than yours but it’s done. Can you tell me please what sides I am to join together? The long or short sides, and do I sew wrong sides together or right. Sorry for all the questions, have a great weekend, and thanks in advance! I’m gonna try this when I’m done with my sisters afghan blanket. And is there a way I could like add a cell phone holder for it? Been wanting a purse like this but in stores it’s 40.00 dollars for a purse. And half the time my phone doesn’t fit in it.? So gonna do this. Would love yarn work? Or stronger yarn?